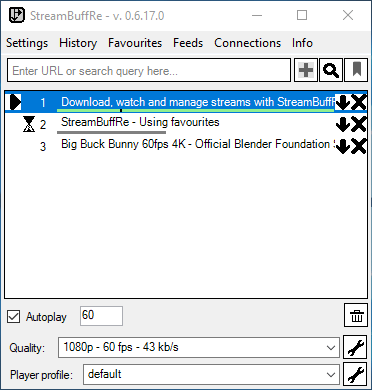 StreamBuffRe - (Buffer and Redirect Streams) enables you to buffer (download into ram) and redirect media streams towards various destinations. Based on this core functionality, you can watch, save and manage many available media streams. Its plugin architecture provides a way to add even more functionality. organize your streams in favourites and get informed about new ones via feeds. If you find a bug, have ideas for new features or have questions let us know and visit StreamBuffRes issue tracker on GitHub. Click to switch themes In the main window you can either add streams to the playlist via URL or start searching them. Once in the playlist you can save or watch streams, add them to your favourites and much more. The bars beneath the stream names tell you the buffering progress. Once green the download is complete. Beneath the playlist, you can select the quality of the selected stream and the player settings used to watch it. 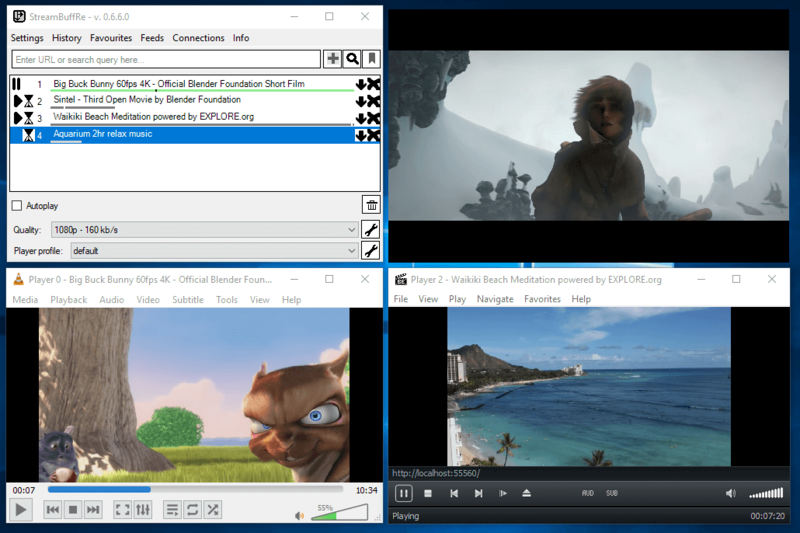 You can minimize StreamBuffRe to your system tray and let it run in the background while buffering and watching streams. Hovering over StreamBuffRes sytem tray icon will open the preview window and inform you about your streams. One of StreamBuffRes main features is the tight integration of external players which lets you watch several streams in different players at once. You can also buffer other streams at the same time, as long as your internet connection can handle it. The different player profiles are the perfect way to start the players just like you need them. Perfect for multi monitor systems, especially when playing in full screen in one of them while watching streams on another one. You can search for streams and playlists from several services. The picture shows the results, which may contain videos, livestreams and playlists. 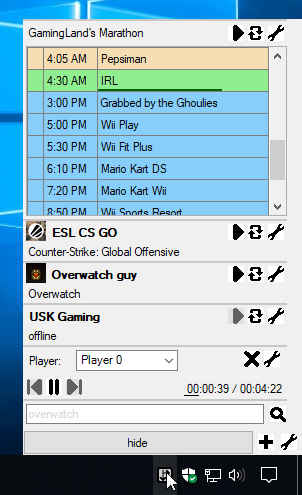 You can add them to StreamBuffRes playlist or favourites and directly watch them with a single click. The result window can be customized to search only with specific services, change the order of results or switch to the bright theme. StreamBuffRe instances can be connected to each other via different types of connections. This works in your LAN or online without the need to create any user accounts or a central server. Once connected to others you can see what they watch right now and play it for yourself; even synced from the same stream position. Furthermore, you can exchange favourites and feeds as well as recommend streams to others. 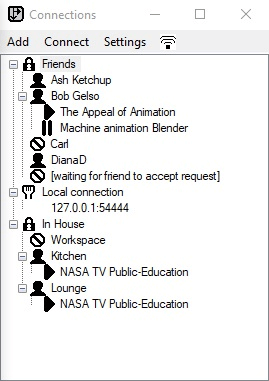 The screenshot shows the Connections window with several active connections. Some contacts are online and watching streams, others are currently offline. StreamBuffRe provides a slim and classical interface. Icons make it simple and intuitive to find actions and settings. The most common tasks can be done with just a single click; more advanced tasks are organized in clear menus. A dark and a classic bright theme for each window is available to match your desktop enviroment. Don't either watch, save or convert a stream; Use StreamBuffRe and do all of this at the same time. 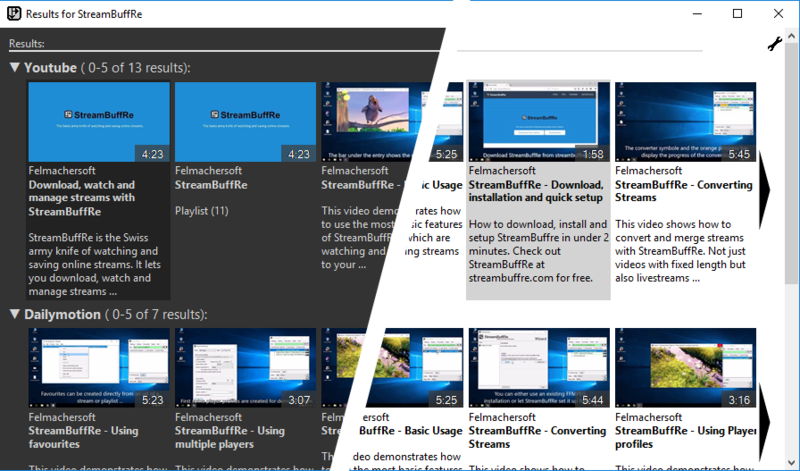 No matter if you want to watch several streams at once or decide on the fly to save some of them, with StreamBuffRe you don't need to download them again. This includes recording of livestreams after you have alredy watched them. StreamBuffRe uses external media players to play streams with best quality and performance. You can create your own player profiles to directly start a player with custom settings, like using a certain screen or audio output device. Also several different players can be started at the same time, showing different streams parallel. If you don't have a direct link to a stream or playlist but know its title you can search for it directly from StreamBuffRes main window. Many popular services are included. Searching for lists of titles at once is also supported. StreamBuffRe and its running players can be controlled via customizable hotkeys even when minimized. One of the hotkeys is the so called boss key which lets you completely hide StreamBuffRe and all running players with a single button. Don't want to sit in front of your PC or no more screen is left to control StreamBuffRe? StreamBuffRes remote control allows you to handle all streams and running players from any device. The only requirement to use it is a modern web browser. No other program or app is necessary. The remote controls interface can also be freely modified to perfectly match every purpose. 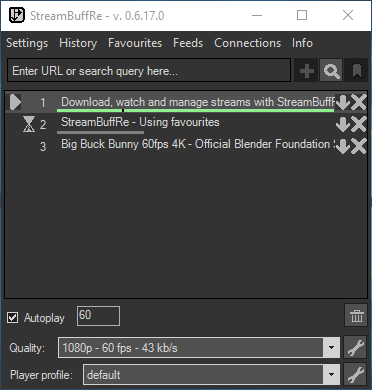 StreamBuffRe is not limited to just save the streams as they are buffered, but can also use external converter to directly get them in the format you need. Extracting the sound from a video or converting a stream to be played on another device for example, are tasks StreamBuffRe will do for you with only a view clicks. Create favourites to start streams with preset player profiles with a single click. Get informed if streams are online or new streams are available, to handle every supported playlist like it would be a podcast. 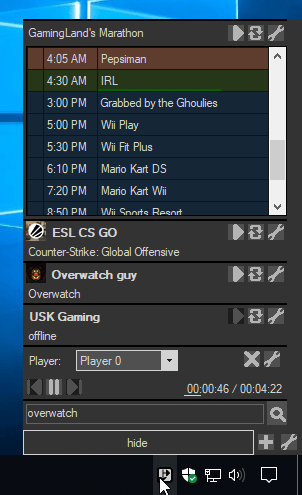 Quickly check something or play a stream by using the preview window. It can be customized with several widgets, like schedules showing when a certain show starts on a stream. The preview window opens automatically, when the mouse is above the taskbar icon and hides again on leave. The constant development not only ensures quick fixing of bugs, but also adds new features. The internal updater keeps StreamBuffRe, its plugins and other external programs up to date for you. It ensures that you always have the latest features available.